Filodivino does not create abstract dreams, but real emotions. Two grape varieties feature in the history of Le Marche, expressing, revealing and celebrating this region since time immemorial: Verdicchio and Lacrima. 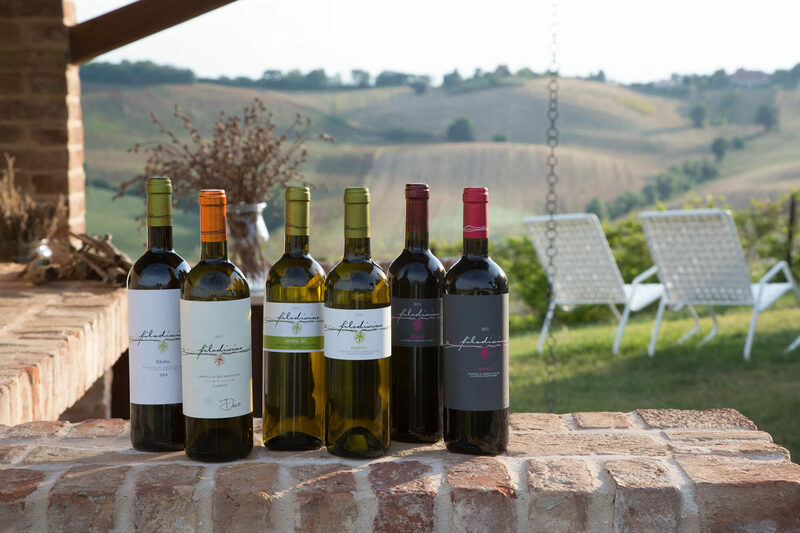 Just from these two grape varieties, Filodivino produces six different wines. There are two DOC red wines: the Lacrima di Morro d’Alba, Diana and the Lacrima di Morro d’Alba Superiore Soara; three Verdicchio Classico dei Castelli di Jesi DOC wines as well as a Castelli di Jesi Verdicchio Classico Riserva DOCG. Verdicchio, which has always been considered a variety local to Le Marche, has a long and mysterious history. One of its first records dates back to 410 AD when Alaric, King of the Visigoths passed through the area of Castelli di Jesi and allegedly stocked up on a wine that gave his men “sanitatem et vigorem bellico”. On the other hand, given its close genetic similarity to Trebbiano di Soave and Trebbiano di Lugana, the ampelographic analysis suggests that the vine was brought by farmers from Lombardy and Veneto, urged to do so by the local gentlemen to repopulate Le Marche’s countryside, which had been devastated by epidemics between the 14th and 15th centuries. Nevertheless, regardless of its origin, in its current habitat Verdicchio has shown an outstanding ability to adapt to the area, losing some traits of its northern brothers whilst developing other unique characteristics. The morphology of the landscape, the exposure to sunlight, the temperatures during the day and through the night, the fact that the vines are equidistant from the mountains and the sea—everything which can be summed up with the Italian word Ambiente and the French word Terroir—have made their mark over the centuries. This variety has shown it can produce both young, fresh wines as well as wines for ageing, both still and sparkling wines, and is even suitable for passito wine. Verdicchio is proud to be Verdicchio. Nothing else matters. DOC status was granted in 1968, and the regulations established the ‘Classica’ subzone, which lies to the right of the river Misa and includes San Marcello. Lacrima, on the other hand, has even more distant roots. There are documents recording its existence that date back as far as 1167, when the inhabitants of Morro d’Alba were forced to supply significant quantities of wine produced with grapes from Lacrima vines to Federico Barbarossa. During his siege of Ancona, the emperor chose the fortified city of Morro d’Alba for his encampment and demanded various provisions from the locals for himself and his army. Despite its thick skin rich in polyphenols, it is an incredibly delicate grape; after heavy rainfall, the skin breaks easily, allowing liquid to seep out from the flesh. As they ripen, the grapes appear to shed tears, hence the name ‘Lacrima’, Italian for ‘tears’. This variety was once very common throughout Le Marche and its neighbouring regions, but due to its delicate nature and difficulty to manage during ripening; its early bud break that leaves the buds susceptible to damage by late frosts; and its low yield, the vines were slowly removed and replaced by other less noble, but more profitable, plants. Only in 1985, thanks to the efforts of local winemakers, Lacrima was given DOC status and from just a few initial vines, there are now over 250 hectares dedicated to this variety, although it is still a wine with rather limited production. A stunning ruby red colour with violet hues, it has an intense aroma of red rose petals, violets and forest fruits. Lacrima, with its unique fragrance and assertive flavour that made it so popular during the late middle ages, is making a comeback.